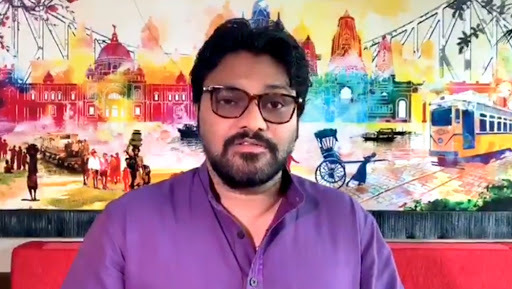 Kolkata, March 19: BJP MP from Asansol and a Union Minister Babul Supriyo will soon get a show cause notice for violating the Election Commission’s Model Code of Conduct, after he allegedly released BJP’s poll theme song on social media. A complaint has also been lodged by Trinamool Congress on Supriyo’s recorded song for degrading its party chairperson Mamata Banerjee in the song – ‘EI Trinamool Aar Nai (No More to This Trinamool)’. Taking cognisance of the complaint and the video, which is being circulated on the social media – WhatsApp, Twitter and youtube – the Election Commission has sent a letter to the Union Minister, say sources. While, Supriyo is yet to receive the show cause notice. It is to be known that Supriyo had recorded the video in Mumbai’s studio. Lok Sabha Elections 2019: Left Front Committee Releases First List of 25 Candidates for West Bengal. The Commission had stated the permission for releasing the video was not taken, and as per the rules, it is mandatory for a political party or candidate to take permission from poll conducting body before releasing any material related with elections. Earlier on Monday, after the video was circulated on social media and on Tuesday morning, a complaint was filed by West Burdhwan Students’ Library Coordination Committee at Asansol’s West police station. West Bengal Lok Sabha Elections 2019 Dates: Constituency-Wise Complete Schedule Of Voting And Results For General Elections. Responding to the video released on social media, Supriyo had said that some enthusiast captured video while he was recording the video in the studio. Adding more, he claimed that the person had only circulated the video on social media and he is not involved in this.